Kärsämäen Paanukirkko, the Wooden Church of Kärsämäki, Finland. I have just returned from a little holiday, during which I visited the Louisiana Museum of Modern Art. The museum and its beautiful gardens overlook the Øresund from the village of Humlebæk, near Copenhagen, and is the most stunning setting for its world-class collection of modern art. One exhibition caught my imagination: New Nordic: architecture & identity. It grabbed me for three reasons: I was not expecting it, it explored identity through design and architecture, and underlined why design is so important to the various Nordic peoples. I could never imagine an exhibition on English or British identity — no flags or ‘history’, just our connection to the land, and we have transformed it and it has transformed us. The New Nordic exhibition contained many examples of new architecture, but I was surprised by a section on church architecture. I should have considered that the Nordic countries, each with their prominent national Lutheran churches, have an enhanced sense of public ownership of their churches. Some of the designs were too austere for my taste — whitewashed concrete, glass, steel and solid angles — but some revisited the tradition of building in wood. These warm, textured church buildings are architectural invitations to pray, to step into the light of the divine. I settled on Kärsämäen Paanukirkko — the Shingle Church of Kärsämäki — from among the modern wooden churches on display because of its simplicity. 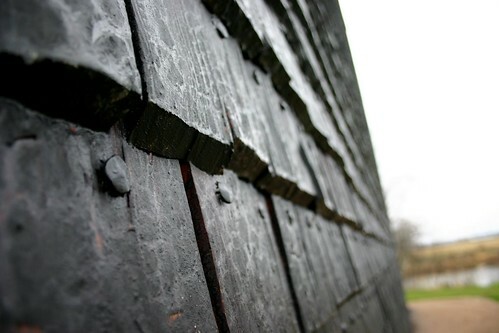 Close-up of the tarred shingles that form the outer jacket of Paanukirkko. Kärsämäki is a small town in northern Finland (Northern Ostrobothnia), in the Diocese of Oulu (Kalajoki Deanery). Paanukirkko was built in 2004 using 18th-century traditional techniques, an idea put forward by architect Panu Kaila (his book Talotohtori, ‘the House Doctor’, is a popular guide to traditional Finnish building techniques). As Professor of Architecture at Oulu University, he suggested a competition to build a new church for Kärsämäki using this principle of a modern design hand-built with traditional techniques. The competition was won by Anssi Lassila‘s design for a wooden core building fitted with a black-tarred shingle ‘jacket’. The black shingles contrast with the light pine interior, which adds to the thermal and optical effects of moving from dark, cold to light, warm with a spiritual dimension. The white lantern at the pinnacle of the roof bears a simple cross in its design to tell us this is a church, and lets cascades of Nordic light flood the interior of the church. This cross-lantern feels the exact opposite of the neon crosses that top out some churches. The latter are gaudy, artificial attempts to hit the passer-by with its message, while this lantern draws in light, as the cross draws believers and the church draws worshippers. The proclamation is the congregation, coming and going with the light of the cross; the proclamation is natural, human, two-way. That the church is hand-built — every black shingle, every pine beam selected, prepared and attached by human hand — also emphasizes its humanity. The shape of Kärsämäen Paanukirkko is not the simple rectangle or cruciform of most Finnish churches, but is a box topped out with a pyramidal rood. The focus is fairly central, the altar to one side with the congregation seated around (I would prefer to see an altar placed right in the centre). The pine pews set in the pine-clad interior reminds me of the more internationally renowned subject of Finnish building design, the sauna. The rest of the world has cheapened and debased the sauna, but this building is near sacred to Finns. The Finnish saying, saunassa ollaan kuin kirkossa, “One should be in the sauna as in the church”, perhaps says all we need to know about how highly the sauna is regarded. Families take saunas together naked, women used to give birth in the sauna, and the dead used to be prepared for burial in the sauna. It is a clean place, a place of purity, a place where all are equal in their nakedness, birth and death. Perhaps it is not so naive that my first thought when I saw a picture of the inside of Paanukirkko was that it looked like a very beautiful sauna, and it is not so surprising to know that Anssi Lassila and his partner have designed and built saunas as well. This church building represents cleansing even to a non-Finn, and that central lantern is both a baptism of light and a draw heavenward for the eyes. It is this fundamental reciprocity of movement — going in and coming out, descending light and drawing up of the gaze — that makes this church not just a dynamic building, but one that treasures human interaction with its space. Not many of our churches can enfold and awe, amaze without imposing barriers to progress. View of Paanukirkko, its bell tower and approach, and the Pyhäjoki. The setting for Paanukirkko is a wide grassy stretch, flanked by trees, beside the swiftly flowing Pyhäjoki (literally ‘sacred river’). Its approach is a long, raised boardwalk across the fields, with a mostly unimpeded view of Paanukirkko, and part way walking under the A-frame bell tower, which is roofed with the same black shingles as on the church. The path meets one corner of the church, and one enters along a passage between the shingle outer coat and the inner timber building to reach the inner door. This passage runs all around inside the epidermis of the building, and also incorporates a vestry, storage and facilities. However, on entering, this passage makes a wonderful liminal space between the dark and the light, and it is kept dimly lit to contrast with the brightness of the inner church. Looking back down the passage towards the door. Kärsämäen Paanukirkko is a great example of built theology that speaks with a primal language of contrast, movement and simplicity, and it is stronger for that. Its hand-built tradition particularly echoes not just the wooden churches of Finland, but also the old cleansing ritual of the sauna. Its modern design reflects the ability of a good architect to build a story that enchants the lives of all who pass by or enter in. Its only failing is the lack of liturgical courage to build an altar — round or, even better, a cube, that says this is the place, the consummation of your journey here — at the centre of the church, rather than a movable table to the side. Categories: Christianity, environment | Tags: Anssi Lassila, architect, architects, architecture, Øresund, church, Church (building), Church architecture, Copenhagen, Diocese of Oulu, Finland, Finn, Fredensborg Municipality, Humlebæk, Kalajoki, Kärsämäen Paanukirkko, Kärsämäki, Lassila Hirvilammi, Louisiana, Louisiana Museum of Modern Art, Modern art, Nordic, Nordic countries, Northern Ostrobothnia, Oulu, Oulu University, Paanukirkko, Panu Kaila, pine, Pyhäjoki, Sauna, shingle, shingles, Talotohtori, timber, wood | Permalink. The Church of England means well, it really does; it just finds it very difficult not to put its own interests first. Who could blame us really; that’s what most of us do. Well, we do have this nagging expectation that the Church does the Right Thing. I know that historically we’ve done all sorts of bad things, like burning Catholics, encouraging Puritans to move to America, providing reconnaissance and population control for British colonialism, and generally siding with establishment against the grievances of the poor and needy. But, we’re really sorry: Archbishop Vincent is our buddy now, we have a black Archbishop of York and mission churches on council estates. See, we’re really nice now! Categories: Anglicanism, economics, environment | Tags: Church of England, Climate Camp, climate change, E.ON, fossil fuels, investment, money, RBS, Treasury | Permalink.